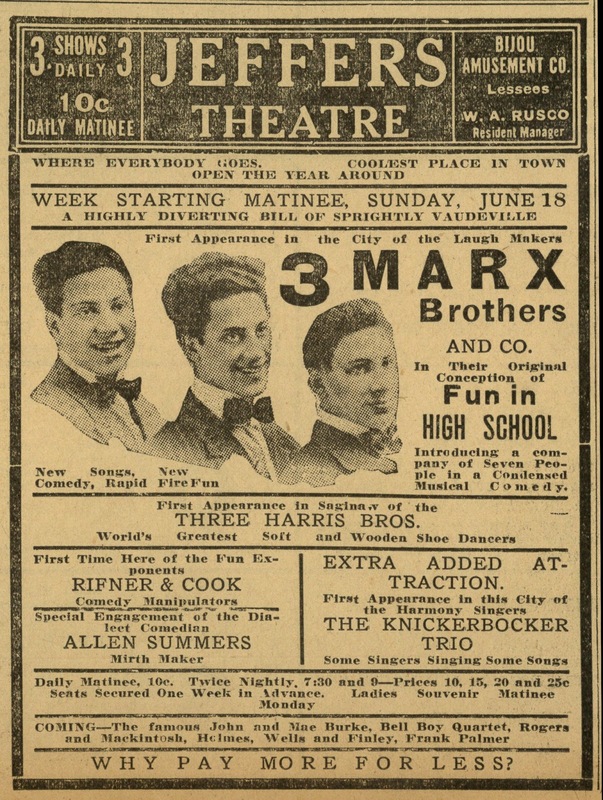 Ongoing lookout for Marx Bros. ads, earlier ones the better, has yielded the above from their June 1911 engagement at the Jeffers Theatre in Saginaw, Michigan, a house renamed the Strand in 1915, and closed by 1935. The boys made up three in a company of seven performing "Fun In High Skule" (aka Skool, or School), being Groucho, Gummo, and Harpo. Grouch was the "Dutch"-accented teacher, Harpo a bewigged character called Patsy, and Gummo in "Hebrew" mode. Another boy took the "sissy" part. 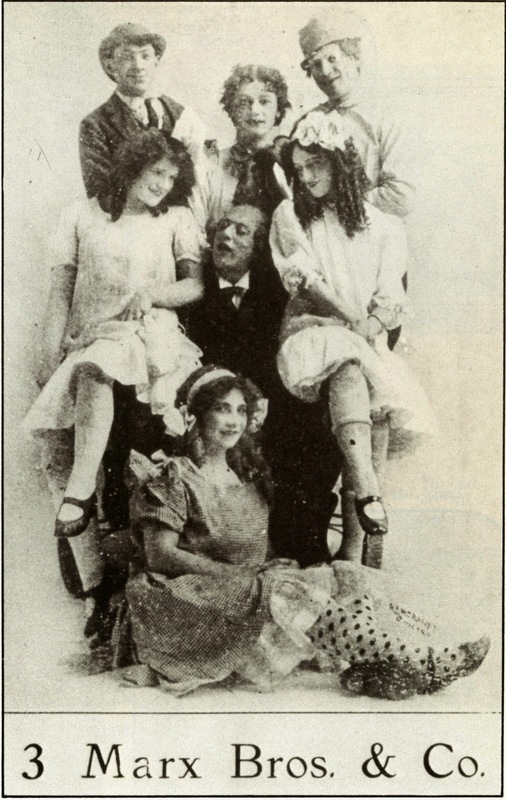 There were variations on the school routine as practiced by the Marxes and other travelling troupes, most under thirty minutes and incorporated into vaude bills, which in the Jeffers' case, ran to total of five acts, top-billed by the Marxes. This is said to have been the team's first routine where comedy was dominant. Chico would eventually enroll as a "student." Such "Sprightly Vaudeville" at "The Coolest Place In Town" was surely worth a matinee's dime admission, or even the princely twenty-five cents required for an evening show. I'd be interested to know if there are any earlier newspaper ads with Marx imagery as here. Certainly this one represents a very early stage in their performing careers. I sometimes wonder about actors -- like the guy who played the "sissy" part -- in acts that went on to mega-success, while they themselves just kind of disappeared. Did they resent how Fate dealt the cards? Were they even able to bring themselves to see their former stage cohorts in the movies years later? Or did they just take quiet satisfaction in playing a small part in their development? We'd have had to ask Gummo that question.